Most species will raise the alarm instinctively if they see a deadly threat. Chimpanzees, however, are way too sophisticated for all that. They actually figure out if the other chimps are aware of the threat, before bothering to say anything. Researchers at Scotland's University of St. Andrews went to Uganda and, in what at first sounds like the most ludicrous setup for an experiment ever, placed some model snakes in the path of wild chimpanzees. When a group of chimps came across the snakes, the first chimp to see them made what's known as an "alert hoo", a call that informs the other chimps that a potentially deadly danger is present. 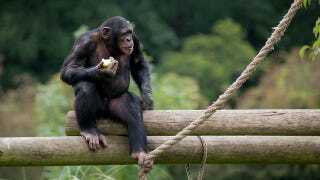 "Chimpanzees really seem to take another's knowledge state into account. They voluntarily produce a warning call to inform audience members of a danger that they do not know about. They are less likely to inform those who already know about the danger." This is the first time we've seen a non-human species recognize ignorance in others and take steps to fill them in. This also demonstrates the explicitly social aspects of chimp communication, as the calls serve to help others avoid danger. It seems to support the idea that language itself evolved in humans at least in part as a way of reducing ignorance through the transfer of information. Now, it appears, that drive to stamp out ignorance might go all the way back to the common ancestor we share with chimps. Via Current Biology. Image by wwarby on Flickr.